MSX Metal Gear (JPN) in 26:28.05 by dunnius. Metal Gear!? It can't be! 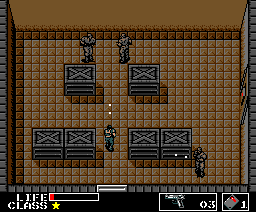 This is the original MSX version of the first entry of the ever-popular Metal Gear series of stealth video games created by Hideo Kojima and developed and published by Konami. In this game, Snake infiltrates Outer Heaven, a fortified state founded by a "legendary mercenary" 200 km north of Galzburg, South Africa, in an operation codenamed Intrude N313. He must find out what happened to Gray Fox, after losing contact with FOXHOUND. In this movie, however, dunnius isn't very stealthy at all; he goes through numerous alerts in order to reach a time of 26 minutes and 28.05 seconds.